Neil Robertson still feels he has had the best season of his career, despite a surprise World Championship exit. The fourth seed lost 10-6 to qualifier Michael Holt on Tuesday, becoming the fifth former champion to lose in the first round at the Crucible this year. 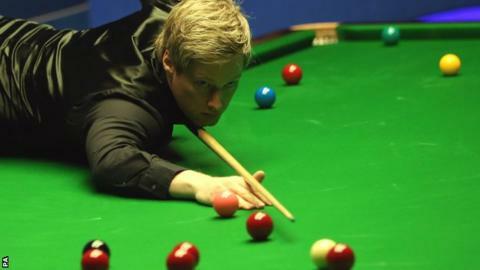 But Robertson, who won the UK Championship in December, said: "The season's been fantastic. "I played great in the Masters, I played great in the Welsh Open - even at the China Open." The 34-year-old added: "It's probably the best match I've played all season and got beat." Robertson beat Liang Wenbo to win the UK Championship and then reached the final of the Welsh Open, losing to Ronnie O'Sullivan. Also this season, the Cambridge-based Australian was edged out by Judd Trump in a classic quarter-final at the Masters, but won the Champion of Champions event. Robertson said he had played some of his best snooker leading up to his Crucible defeat, which he put down to a run of misfortune. "I said coming into the World Championship that it's probably the best season I've had to date," the 2010 world champion said. "I've played really well, but snooker's a funny game. It's very frustrating when you don't always get the right kind of rub - you watch tennis and know if you play better than the other guy, you win. "But that's the game we play. It can create mini-upsets. I suppose if it was the top four players in the world getting to the semis, it'd be pretty boring." Robertson continued: "Michael played a great match - nothing really went right for me. "He's got to take credit for taking advantage, because even though he's coming to the table and the balls are all there, he still has to pot them."